For nearly three decades after Chinese officials predicted the powerful earthquake that hit Haicheng in the north of China on Feb. 4, 1975, details of their prediction process remained closely guarded. But now, after gaining access to formerly classified documents and key people involved with the process, a team of scientists has reconstructed this important event and concluded that earthquake prediction, though challenging, is not impossible, at least for some earthquakes. 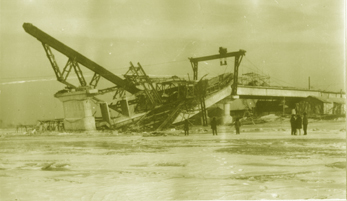 The Feb. 4, 1975, magnitude-7.3 Haicheng quake damaged more than 2,000 bridges, such as this one, as well as homes, transport pipelines, hydraulic facilities. The photo is courtesy of Kelin Wang, published in Liaoning Province Earthquake Administration (2005), Retrospective Photos of the Successful Prediction of the 1975 Ms 7.3 Haicheng Earthquake, Seismological Press, Beijing. More than 2,000 people were killed when the magnitude-7.3 quake struck, but Chinese officials said that their prediction and subsequent evacuation orders just hours before the shakeup saved the lives of thousands more. Although the accomplishment attracted worldwide interest, it occurred during a period of political turmoil  China's Cultural Revolution  and most details of the prediction and evacuation were kept secret as leaders attempted to control perceptions of their success and political authority. This paucity of information, along with the failure of Chinese officials to predict a devastating magnitude-7.8 earthquake in Tangshan about a year later, which killed more than 240,000 people, led experts to question the reality of the prediction claim over the years. In this month's issue of the Bulletin of the Seismological Society of America, however, Kelin Wang, a senior research scientist at the Geological Survey of Canada in British Columbia, and colleagues say the prediction was legitimate. The Haicheng earthquake is the "first, and so far only, case where a large earthquake was predicted," says Susan Hough, a seismologist with the U.S. Geological Survey in Pasadena, Calif.
Wang's team reviewed relevant documents and interviewed key witnesses in the prediction process to compile a detailed account of the events and decisions that led to the Haicheng prediction and evacuation. The team wrote that the prediction was "a blend of confusion, empirical analysis, intuitive judgment, and good luck." After a series of large earthquakes hit northern China in the late 1960s, the report explains, Chinese authorities ramped up monitoring, prediction and public education efforts. By June 1974, based on precursory anomalies that included a shift in land levels in the nearby Bohai Sea area, officials issued the first of two "middle-term" predictions that warned of an earthquake within one to two years. No official "short-term" predictions  warning of an earthquake within a few months  were made, the team says, but some Chinese officials made "imminent" predictions, based on an increase in foreshock activity in the 24 hours before the main shock. Although the imminent predictions correctly identified the quake's location, they did not specify a time, and they underestimated the quake's magnitude. Nonetheless, the predictions  along with some actions taken spontaneously by local citizens  triggered warnings and evacuation orders around the area where the earthquake eventually occurred. According to the team, the evacuations, along with the durable style of housing construction in the area and the time of the main shock  7:36 p.m., when most people were neither at work nor sleeping  saved thousands of lives. Qi-Fu Chen, a research professor with the China Earthquake Administration in Beijing and co-author of the report, calls the Haicheng experience a "useful reference" for reducing earthquake disasters through prediction and preparedness. "The Haicheng earthquake provides hope to precursor-based earthquake prediction," Chen says. It shows that "precursor-based earthquake prediction is not impossible," he says, but it is nonetheless a challenging task that "will require many years of research." Part of that challenge is the simple fact that "fundamentally, we don't know why an earthquake starts," Hough says, and so "in a way, we don't know what we're looking for." In addition, precursor events can vary from one earthquake to the next. While the Haicheng earthquake was preceded by foreshocks, for instance, the later Tangshan earthquake was not. Because "some large earthquakes strike without this sort of harbinger," Hough says, referring to the foreshocks, "clearly one can't look to Haicheng as a prototype for earthquake prediction." Currently, Hough says, "there isn't even a road map" as to what is needed in order to make reliable earthquake predictions (See Geotimes, March 2005). If a breakthrough in prediction does come, she says, "it will probably be some breakthrough that comes out of left field," from a place where scientists don't even know to look. Regardless of the significance of the Haicheng earthquake prediction in the long run, the event was valuable in that it "showed the importance of public education," Chen says. According to the paper's authors, efforts to educate the public prior to the earthquake included the distribution of brochures, which explained earthquake concepts and described how to make amateur observations of precursory events that could help officials in formulating their predictions.